Travellers love autumn in the Arctic for intimate wildlife viewings in one of the most reliable polar bear viewing locations. Directly north of Churchill, Manitoba, Western Hudson Bay is world renowned as one of the most dependable and magnificent polar bear sighting areas. There’s a reason the location for our Polar Bear Migration Fly-In Safari in Nunavut is known as “polar bear alley”. In October and November, polar bears can be seen roaming the tundra waiting for sea ice to form on the bay, allowing for some unbelievable up-close polar bear encounters. 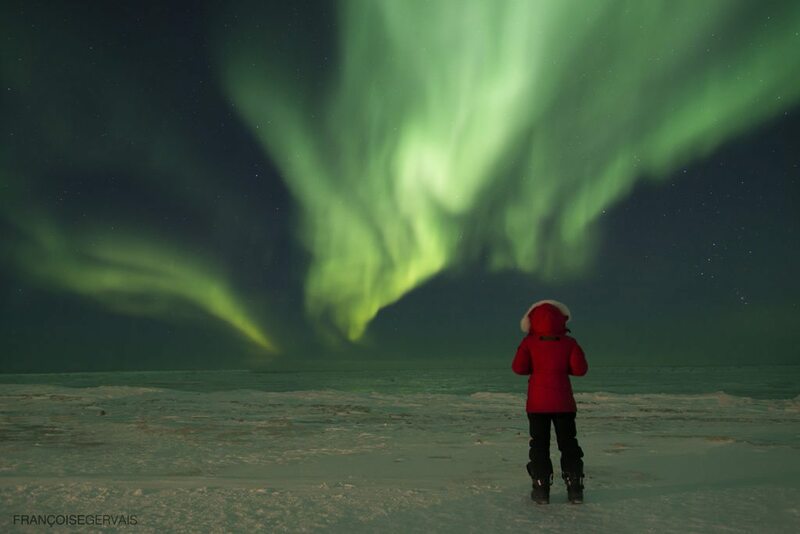 Autumn polar bear tours also offer another bucket list experience: the Northern Lights! It’s one thing to look down on a polar bear from a tundra buggy. It’s a whole other experience to view them face-to-face on tundra. Imagine gazing into the eyes of polar bears from ground level. Walking with polar bears and getting some of the most incredible up-close encounters is an emotional experience travellers can have in the Canadian Arctic in autumn. 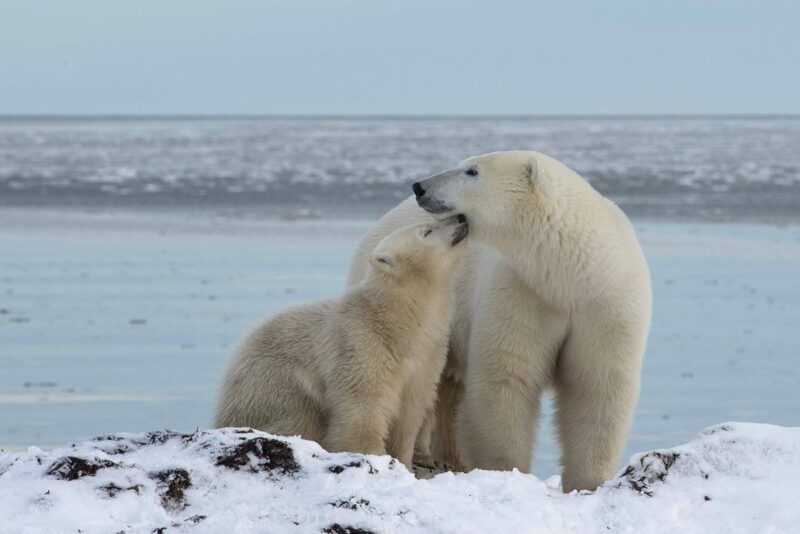 Polar bear tours in autumn allow for a range of polar bear sightings including solo adult male and female polar bears, and mother and yearling cubs. Our travellers love being able to witness charming mother and cub interactions. 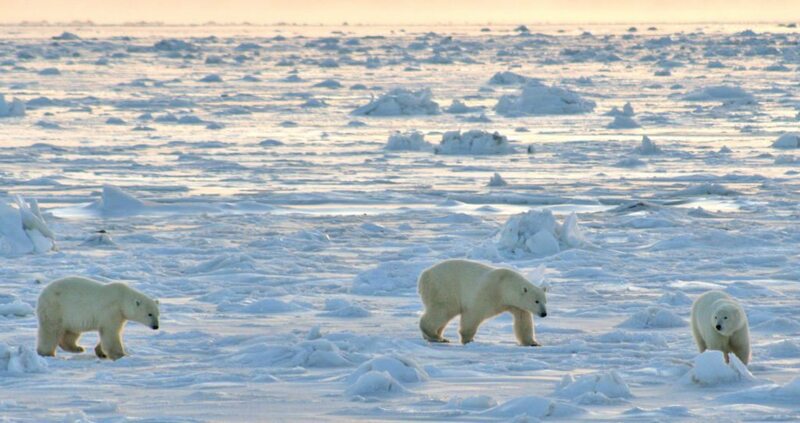 On some departures of Polar Bear Migration Fly-In Safari, travellers have seen as many as 10 polar bears in one day! The unobtrusive electric fence that surrounds the cabin complex allows for safe and incredible close-up polar bear photography opportunities. 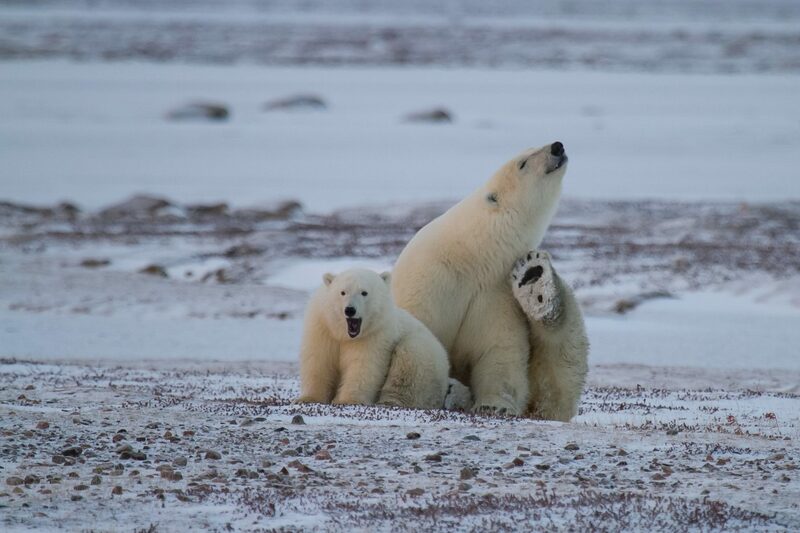 Another experience seldom had on any other polar bear tour? The chance to see polar bears at night! We often see polar bears roam past the fence in the dark – a unique viewing opportunity coveted by many travellers and photographers. 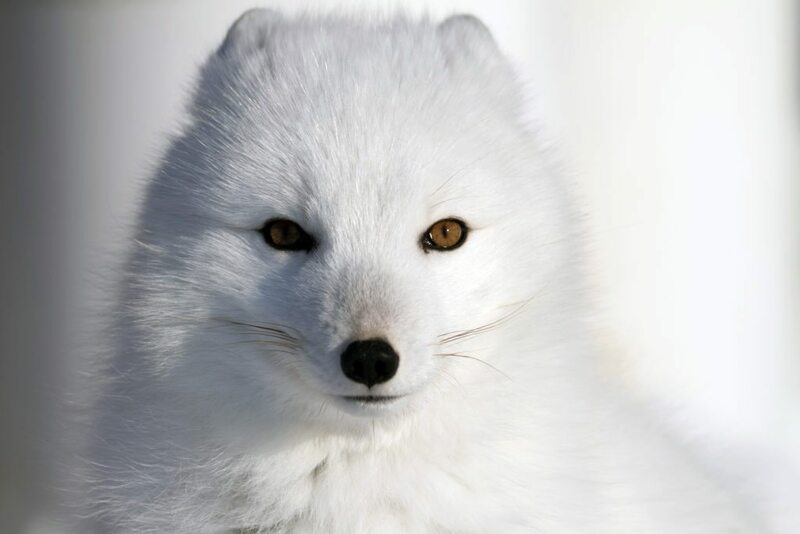 In addition to polar bear encounters, autumn Arctic tours provide opportunities to view other wildlife including Arctic fox, Arctic hare, pine martens, snowy owls and even wolverines. 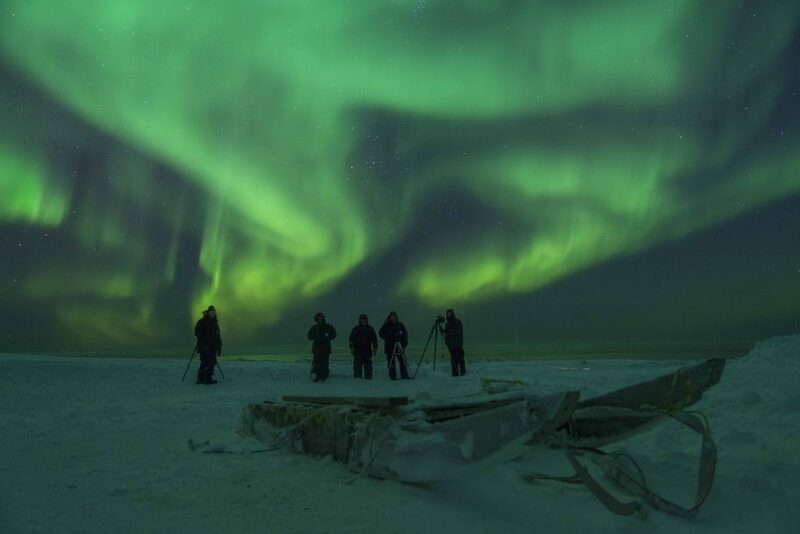 Far from any communities and light pollution, the locations visited on Polar Bear Migration Fly-In Safari and Nanuvik Polar Bear Migration Safari are ideal places to see the Northern Lights in October and November. Our guests are always delighted to watch the aurora light up the night sky on these trips. Of course, our Expedition Leaders are always happy to assist with photographing the Northern Lights. The top two bucket list experiences travellers seek in the Arctic are polar bears and the Northern Lights. Learn more about the trips to see both here. Want to learn more about seeing polar bears in autumn? Find out how to discover the polar bears of Hudson Bay on autumn polar bear tours on our webinar: Autumn Polar Bear Adventures. Want to see polar bears up-close during the autumn in the Arctic? This fly-in safari provides an incredible off-the-grid experience to see the Northern Lights in October and November. This eight-day trip offers exclusive opportunities to view polar bears up-close during the day and dazzling Northern Lights at night, in the comfort of our remote Polar Bear Cabins, located 110 km south of Arviat, Nunavut, on the coast of Hudson Bay. View the itinerary and trip details here. This unforgettable exclusive polar bear tour is specially designed to get you as close to polar bears in the wild as possible. 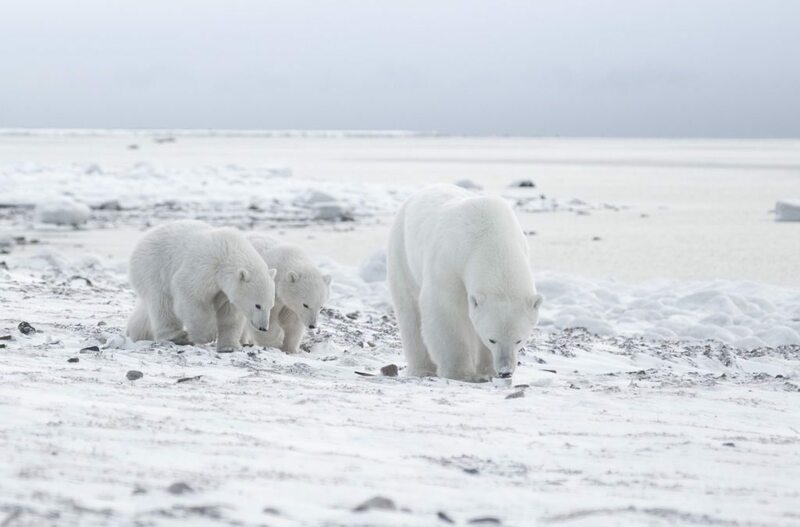 Discover the land of polar bears and Inuit in the remote Arctic tundra on the coast of Hudson Bay on the ultimate exclusive polar bear viewing experience. Spend your nights at a newly built, exclusive cabin complete with executive chef, local Inuit guides and an Arctic Kingdom naturalist guide. View the itinerary and trip details here.